En el encuentro de Couchsurfing Triana 180928 podrás hablar, reír, cantar, bailar, beber y practicar idiomas, en un encuentro internacional en Triana. Todos los Viernes el grupo de Couchsurfing estará por allí. Habrá amigos locales e internacionales. Para los nuevos, encontraréis una bandera de CS Couchsurfing en el punto de encuentro. ¡Todo el mundo es bienvenido! En el punto de encuentro podemos pedir bebidas y tapas a buen precio. Habrá buena música y gente amable en un lugar animado. Esta noche vuestro anfitrión será Alfonso Mora. 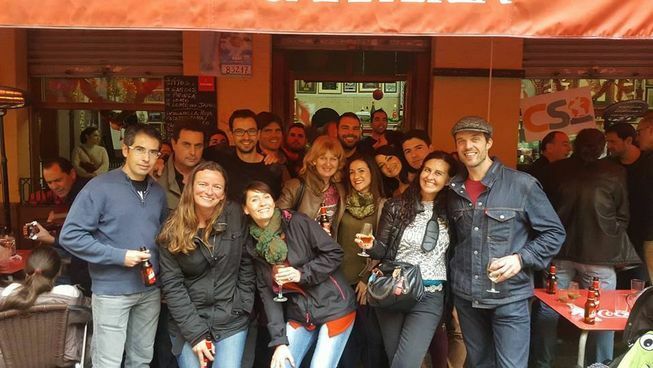 In Couchsurfing meetings, every Friday you can talk, laugh, sing, dance, drink and practice whatever language you want to, in an international meeting in Triana. Every Friday Couchsurfing group will be there. There will be local and international friends. For newbies, you will find a CS Couchsurfing flag in the meeting point. Everybody is welcome! At the meeting point we can order good price drinks and tapas (It’s an appetizer or snack in Spanish cuisine). There will be good music and friendly people in a lively place. Tonight your host will be Alfonso Mora. If you want to know everything about our meetings, ask a question or keep practicing languages, you can join our WhatsApp Groups of Language Exchange. We have groups for different languages and for doing different activities which they don’t a direct relation with languages (movies, sports, going out, sightseeing, etc…).